The prices of premium smartphones have skyrocketed in the last few years. Flagship phones from Apple, Samsung, and other vendors command prices of $1,000 or above. Fortunately for customers, US technology giants like Apple and Google are still selling somewhat affordable phones in their lineup. 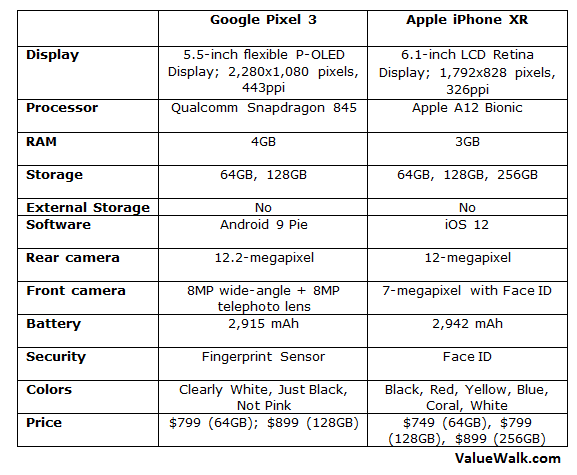 Google Pixel 3 and iPhone XR are the most affordable options available from Google and Apple, respectively. At starting prices between $700 and $800, these are not exactly affordable but they attract customers who don’t want to spend above $1,000 on a smartphone. Let’s dive into a detailed Google Pixel 3 vs iPhone XR comparison to help you decide which one is a better buy. The iPhone XR gets a display notch like the iPhone XS and XS Max. The notch accommodates the front camera and sensors that support the Face ID technology. It measures 150.9 x 75.7 x 8.3 mm and weighs 194g. The front and rear glass panels are supported by an aluminum frame in the middle. Its main camera doesn’t sit flush with the back panel, making it susceptible to damage. It comes in Black, Red, Yellow, Blue, Coral, and White colors. Both the iPhone XR and Pixel 3 lack the 3.5mm headphone jack, and the rear panel of both phones is made out of glass. However, Google has used a two-tone design that blends the glossy and matte textures. The Pixel 3 has a single camera on the back. The fingerprint sensor is also placed on the rear panel. Google’s flagship measures 145.6 x 68.2 x 7.9 mm and weighs 148g. On the front, the Pixel 3 doesn’t have a display notch. But it features thick bezels at the top and bottom of the screen. The device comes in Clearly White, Just Black, and Not Pink colors. The iPhone XR gets an IP67 rating for water- and dust-resistance while the Pixel 3 has an even better IP68 rating. The iPhone XR has a larger 6.1-inch LCD screen with a 1,792 x 828 resolution and 326ppi pixel density. Apple claims the iPhone XR display is coated with the “most durable glass ever,” without disclosing whether it’s Corning’s Gorilla Glass 6 or something else. It has a 19.5:9 aspect ratio and True Tone technology that automatically adjusts the display brightness and saturation depending on the ambient lighting conditions. The Pixel 3 features a smaller 5.5-inch flexible P-OLED display. Notably, OLED screens deliver richer colors and truer blacks compared to their LCD counterparts. It also has a higher 2160 x 1080p resolution with 443ppi pixel density and 18:9 aspect ratio. The screen is protected by Corning’s Gorilla Glass 5. The iPhone XR runs the same A12 Bionic chipset as the iPhone XS and XS Max. It gets 3GB RAM and 64GB/128GB/256GB of internal storage. The insanely powerful A12 Bionic processor has outperformed its rivals in almost every benchmark test. Google Pixel 3 runs last year’s Snapdragon 845 processor, which is not as powerful as A12 Bionic but can easily handle any task you throw at it. The Pixel 3 packs 4GB RAM and comes with 64GB and 128GB of internal storage. Google doesn’t offer a 256GB storage variant of Pixel 3. Neither phone supports external storage, so you would want to go for the higher storage variant when buying the new phone. While Apple offers only 5GB of iCloud storage for free, Google Pixel 3 gives its customers unlimited free cloud storage for photos and videos at their original resolution. For authentication and security, the Pixel 3 has a capacitive fingerprint sensor on the back. It’s fast, secure, and reliable, though a little inconvenient. The iPhone XR offers Face ID technology for security, allowing you to unlock the device and authenticate payments with your face. The TrueDepth camera also supports Memoji and Animoji features on the iPhone XR. Both the phones have a single camera on the back. Smartphone vendors have flooded the market with devices featuring three, four, and even five cameras. But the single lenses on both the iPhone XR and Pixel 3 offer excellent photography experiences. The iPhone XR has a 12MP wide-angle lens with an f/1.8 aperture on the back. The front camera is 7MP with an f/2.2 aperture. On the other hand, the Pixel 3 features a 12.2 MP, f/1.8 lens on the back. It has dual 8-megapixel lenses on the front for selfies. Both the handsets use software algorithms to take portrait images using a single rear camera lens. But there is a difference. The portrait mode on iPhone XR works only on humans, but the Pixel 3 allows you to take portraits of anything. Both the phones are capable of taking HDR images. When it comes to video recording, the iPhone XR has an edge. Google’s phone is loaded with software features such as Top Shot that recommends the best photo taken from all the exposures captured by the camera. It also has a Night Sight feature that enhances the quality of photos taken in low-light conditions. The Pixel 3’s Super Res Zoom also delivers excellent results. If you are a photography enthusiast, you will not be disappointed with either phone. The Pixel 3 packs a decent 2,915mAh battery, which should easily last a full day of normal usage. It supports fast wireless charging. However, various real-life battery tests have shown that the Pixel 3 lags behind iPhone XR in terms of battery life. The iPhone XR packs a 2,942mAh battery. Both the devices support fast charging and wireless charging. Unfortunately, the iPhone XR doesn’t include a fast charger in the box while the Pixel 3 does. Google Pixel 3 runs Android 9 Pie out of the box while the iPhone XR runs Apple’s proprietary iOS 12 software. Google’s device has a lot of AI features integrated into it. To being with, the Google Assistant is far superior to Siri in every aspect. The Pixel 3 also gets a call screening feature that screens against scam calls and telemarketers. It answers calls on your behalf and you can read transcripts of the conversation in real-time. Then you can decide whether to answer the call or block it. Digital Wellbeing in Android Pie and Screen Time in iOS 12 are basically the same features, allowing you to monitor and control your screen time. The iOS 12 also allows you to turn yourself into a Memoji using the TrueDepth camera. Both operating systems are fast, secure, and intuitive. It boils down to which one you prefer. The Pixel 3 starts at $799 for the base model with 64GB storage and goes up to $899 for the 128GB variant. The iPhone XR is a little less expensive than the Pixel 3. It costs $749 for the 64GB model, $799 for 128GB, and $899 for the 256GB variant. These are the official prices. Considering the devices have been around for a while now, you can get them at discounted rates online.